How Do I Get Rid Of "overseer.exe"? - Ask Leo! How Do I Get Rid Of “overseer.exe”? Overseer.exe can be left behind after an uninstall of Avast Free Anti-virus. Deleting it is a two-step process. Overseer.exe is apparently installed sometimes by Avast Free Anti-virus (and possibly other packages). 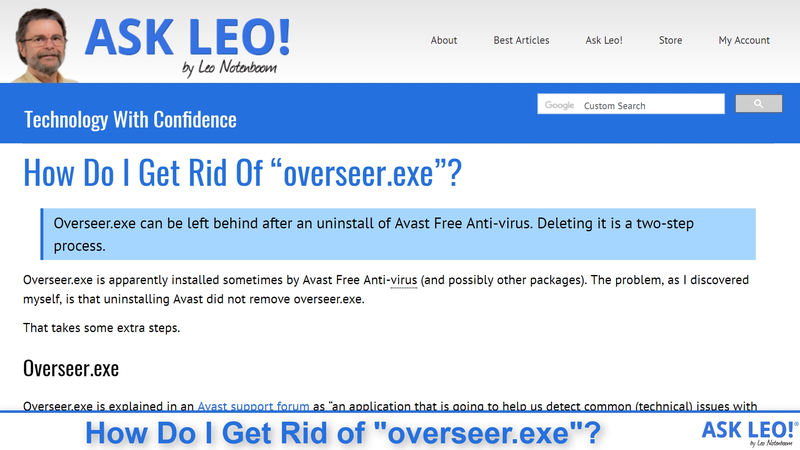 The problem, as I discovered myself, is that uninstalling Avast did not remove overseer.exe. That takes some extra steps. Overseer.exe is explained in an Avast support forum as “an application that is going to help us detect common (technical) issues with our products.” The gist is that it periodically looks for common problems in Avast software and (presumably) attempts to fix them. CCleaner Install with Avast as a PUP. I uninstalled Avast, only to note that “Avast Overseer” was still running even after the final reboot. I didn’t find it in any start-up information, so I dug deeper into finding out where it lives and how it gets run. The short answer is that it lives in C:\Program Files\Common Files\AVAST Software\Overseer, and it’s run by the system’s Task Scheduler. We need to deal with both. Click the Start icon, start typing “scheduler”, and click on Task Scheduler when it appears in the results. Task Scheduler showing the Overseer task. 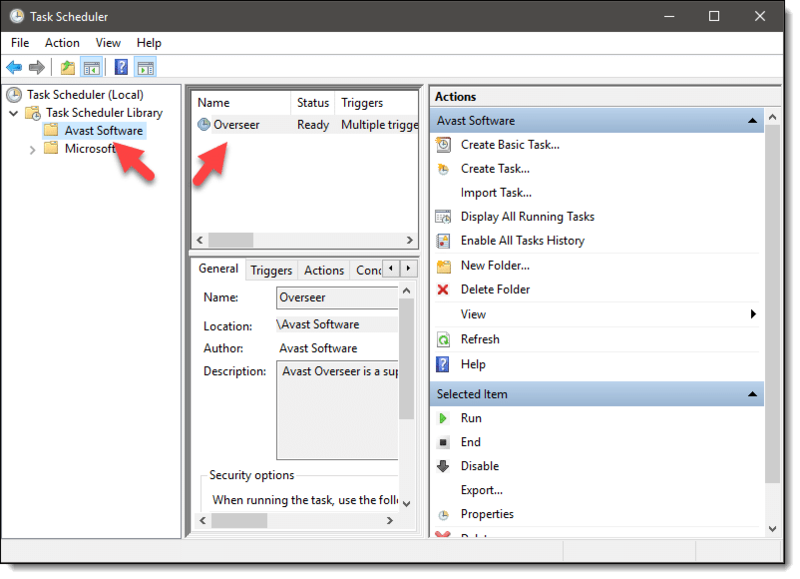 In the left-hand pane, click on the greater-than sign in front of “Task Scheduler Library” to expand its contents, and then click on “Avast Software”. The middle pane will show a single task, “Overseer”. Right-click on that task and click Delete. You’ll need to confirm that you want to delete it, and after doing so, it will be gone. In Windows File Explorer, navigate to C:\Program Files\Common Files\AVAST Software. Overseer should now be gone. This whole experience reminded me to be careful, always, when installing software. PUPs appear in various places, and the only way to avoid the majority is to be vigilant. I wasn’t. How Do I Schedule a Nightly Reboot in Windows 8.1? 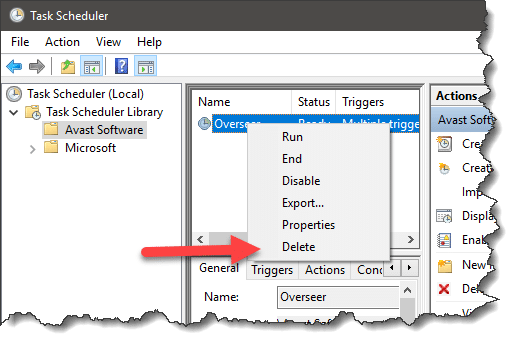 (with video) - Scheduling a nightly reboot or shutdown is easily done using Windows Task Scheduler and the built-in shutdown command. How Do I Change the Default Installation Drive? - In this scenario, the real issue is that your C: drive is full. What I recommend you do is clean it up. 1: Yep, it happens to me too. « Previous post: The Journey to My New Computer: Just What Do I Do All Day? I didn’t think I had Overseer installed but I followed the instructions in this article in case I might have had other remnants installed and it turned out Overseer actually was there. So if you see this article and don’t think it applies to you check out the Task Scheduler, you might also be surprised to find it. I knew I had accidentally installed AVAST while installing CCleaner, and I took care of that. Only through this article did I discover that overseer had been installed. I had deleted the AVAST folder months ago, but the scheduler was still trying to run the task – failed, because it couldn’t find the exe. Now that has been deleted. While in the scheduler, I found a couple of other items that should not have been there. All fixed. Thanks Leo for the extra insight! I used to periodically check the Task Manager for unwanted startups. Now I’m also going to periodically check the Task Scheduler for unwanted startups. When that happens to me, I use Revo Uninstaller. It’s very thorough, and usually gets everything that came with the original program. If not, it will show the program in the list of installed programs, and will let you uninstall it along with all of the registry entries. Just as an aside, I don’t recommend CCleaner for everyone. If you are a novice PC user, CCleaner can , and will delete files that some people wouldn’t recognize as important, and could cause them issues moving forward. I recently uninstalled Avast and didn’t realize that Avast left behind files that weren’t removed upon restart. Shame on Avast for not being tidier. Man…you learn something new every day…even at 69…just goes to show, you never know “what lurks below.” I, also forgot to un-tick the box while up-dating ccleaner…knew it when I did it, immediately uninstalled, figured that was the end-of-it, thanks Leo! Avast should be ashamed of themselves! Right-click on an unoccupied area of the toolbar and you can uncheck any toolbars you want to hide from view. Avast isn’t the only program to do this, which is rather naughty considering what Avast is supposed to do. I have used Revo Uninstaller for years and regard it as indispensable. Just watching the uninstall process is an eye-opener. It can also be useful to drill down through your installed programs’ folders (program Files and program Files (x86), with something like Commander, which can show you a folder or file that should have been deleted with the program but wasn’t, and to check out folder/programs you don’t recognise. Thanks, Leo, but when I tried this, I found I needed permission from “SYSTEM” as well as admin permission. How do I get “SYSTEM” permission?? Interesting, I’ve not run into that at all. All I can suggest is rebooting into safe mode perhaps, or using one of the recover consoles available, depending on your version of Windows. Heck, even booting into a Linux live CD might do the trick to let you delete it. You can mark those emails as spam if they don’t have a working unsubscribe link. If you do mark it as spam, in some cases, this gets them a black mark as spammers with your email provider. Thank You Leo… I had it too and I do not ever remember having Avast installed. I don’t remember installing Avast either. Maybe there’s also another Unwanted Program which installs it. I don’t like the term PUPs. There’s nothing potential about any of them for me. if I want a program, I’ll look for it and download it. 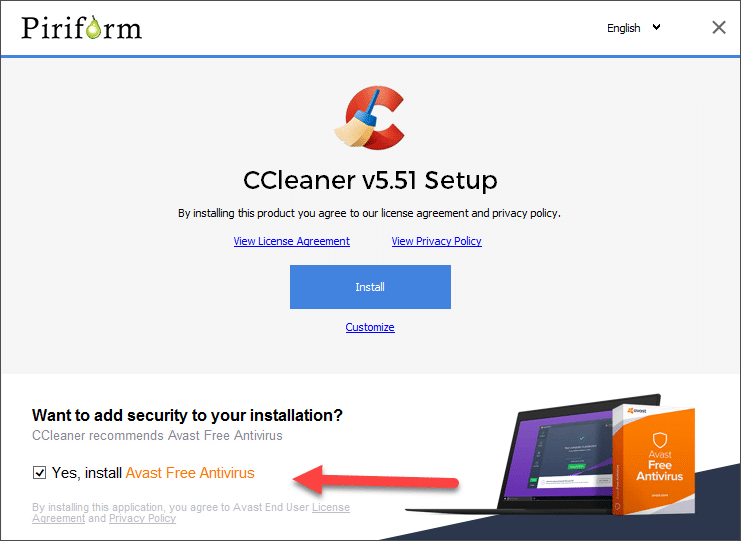 If you run Avast antivirus, don’t be surprised if Overseer shows up again after an Avast update (after you think you’ve deleted it). Avast covers themselves in the license agreement by basically saying they can install anything they want to on your computer. This article gives two good examples for not allowing applications to take over your computer and update whenever and whatever they want. Older versions of Avast didn’t have Overseer and older versions of CCleaner didn’t have PUP installation tactics. If you think getting updates necessarily gets you “better” or “more secure” software you would be wrong most of the time. Check the release notes to see exactly what changed for a newer version. Save the installation executables (or msi) for whatever you install so that you can resurrect an older version of an application if you need to. Most updates are to fix bug and security vulnerabilities. Take the updates and carefully read every screen before tacitly agreeing to unwanted programs. If they don’t give you a choice to refuse unwanted programs, uninstall the original program and look for an alternative. I’ve been using a utility named “unchecky” which automagically unchecks all those boxes during an installation that install other great, uh stuff. Very useuful. 1. Always do custom installs, never express installs. 2. Install unchecky (just once) and make sure it is part of your startup. It will operate in the background to monitor those pesky PUPs and such. Thank you for this article. I followed it and didn’t find overseer.exe under AVAST but under AVG. So I deleted it there. Some how I got infected with “traffic outbrain ads” when I play x box games. I have tried everything imaginable and can’t get rid of it. It doesn’t shoe up as malware. I found it in Program Data as a folder “Avast Software” and simply deleted it and it ended it. THANK YOU SO much Leo as my my….ahem cough cough….teckie husband thinks hes a computer WIZ…lol…He put Kapersky Total Security on a laptop for a year when we first bought it and it just expired and they wanted $124 for 3 computers for “ONE YEAR” I said NO WAY so got rid of everything I could find on Kapersky and deleted it from my 1 yr old LT. Then MR Teckie Hubby decides hes gonna put Free Bit Defender, then He put Free Advast on computer and then said he cant put ANY free antivirus on machine so I enabled Microsofts Window Defender and put Norton on it as I get that for free with my ISP hate it coz its a resource hog but wanted extra security on computer!. Hubby thought you can just delete things and they go away but thats NOT the way it goes, and I had to look deep into computer to get all that crap out but this oversee from Advast I knew nothing about and you came to the RESCUE!! Thanks SOOOOO VERY MUCH (No not yelling at ya) just SOOOOO happy I got that crap off my computer!! Truly appreciate your help !! !